I love curry houses, I really do. I love the retro kitsch decor, the awful music, the poppadoms with bright yellow sauce, and the overwhelming choice of dishes (which all taste reassuringly familiar). I love the token vegetable sides, the pints of Cobra, and the after-dinner mints. But one thing I don't love is the desserts. Why on earth do 95% of Indian restaurants have the same awful selection? Lemon sorbet stuffed inside a lemon skin. Coconut ice cream stuffed inside a coconut shell. Pineapple ice cream stuffed inside a hollowed-out pineapple. Kulfi moulded into a "mountain" shape. It's pathetic... and that's coming from someone who loves ice cream. A couple of proper Indian desserts wouldn't be hard to make, and I'm sure they would be top sellers. Anyway, the other day I was in Asda - I don't often shop there, but happened to find myself on Old Kent Road, so I popped in. And let me tell you, I was pretty impressed. 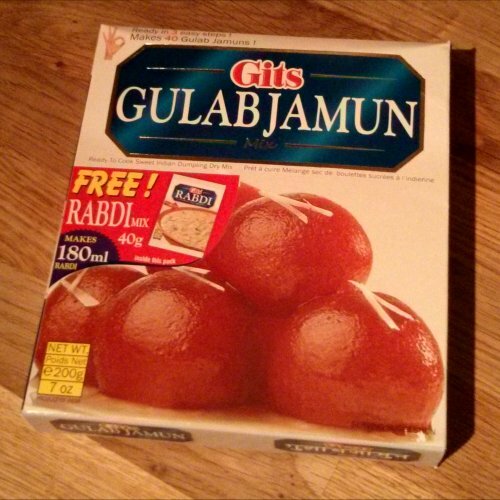 Particularly with the world food section, in which I found this - Gulab Jamun Mix! 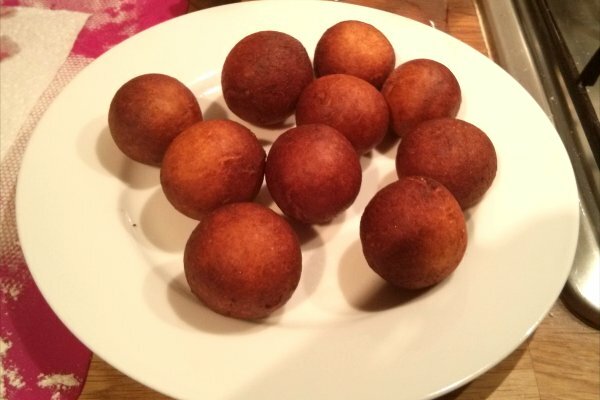 Gulab jamun is probably my favourite Indian dessert - they look like little mini doughnuts or dumplings, and are made of... well I'm not really sure what they're made of. But mine were made of water, milk, and gulab jamun mix. 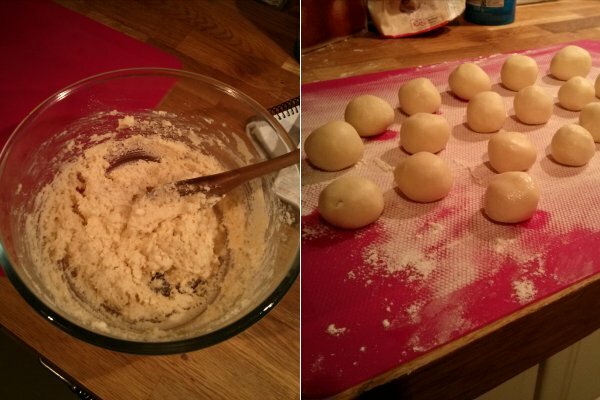 You just have to make up the dough, roll it into balls, and deep fry them for a few minutes. The packet says it makes 40 - but I only managed half of that. When it comes to the syrup, you have to make it yourself - you're on your own. So I made the syrup out of equal quantities of water and sugar, and added cardamon, saffron, and honey. 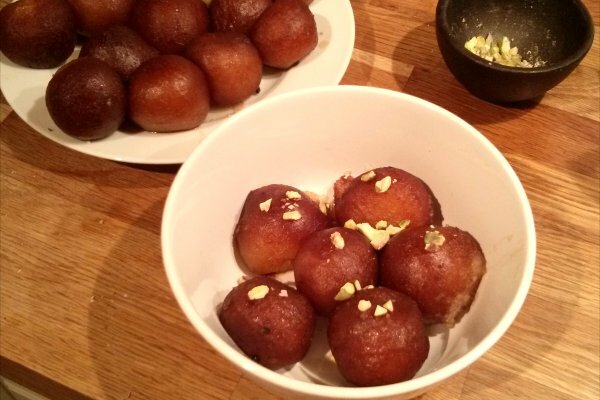 I then dunked the gulab jamun in the syrup, and served ate them warm with some crushed pistachios. I honestly can't understand why every Indian restaurant up and down the country isn't serving this. It's cheap and quick to make, and tastes absolutely cracking. But no, instead we get the same old crap that's been at the bottom of the freezer for the last 10 yeas. I really wish they would stop insulting us with this rubbish, and give us the real deal. So onto the ratings. This may be the de facto national dessert of India, but that doesn't change the fact that it is truly filthy. Deep fried dumplings soaked in syrup? You couldn't really make up a less healthy (or more tasty) dish. You should pop to you local Indian and start petitioning them! Great idea... could give away free samples outside, Heston B style! 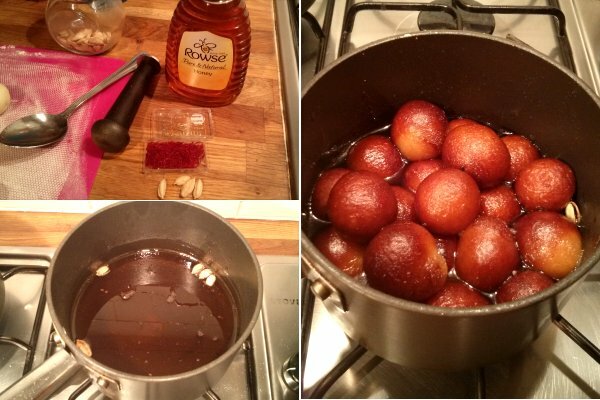 I tried to follow your steps in making gulab jamuns, it was soft and delicious. Your way of presentation is very simple and easy to follow.